nutraCoster is a powerful software program for analyzing recipes for both cost and nutritional content. It is primarily used by bakeries, commercial food producers and others who need the required Nutrition Facts and Ingredient Label Panels per both US and Canada rules for their product labels, along with product food costing, labor costing with setup and assembly time tracking, process steps and detailed nutritional analysis. Free, same-business-day download delivery. nutraCoster is a powerful tool for analyzing recipes or formulas for food cost and nutritional content. It is used by bakeries, commercial food producers, restaurants and others who need an easy way to make the required Nutrition Facts and Ingredient Label Panels per both US and Canadian rules and especially to meet retail market's food labeling expectations. Required Nutrition Facts and Ingredient label panels are generated automatically from your recipes in both US and Canadian formats. You can also do product food costing, labor costing with setup and assembly time tracking, process steps and detailed nutritional analysis. Download Delivery: nutraCoster is delivered by download for same-business-day delivery*. The download is completely self-contained and inncludes the complete instruction manual. To use nutraCoster to make your own Nutrition Facts and Ingredient Label Panels per regulations, all you have to do is enter your recipes. You can print the resulting panels to sticker paper or export them as graphics files to your label making software. nutraCoster automatically produces the labels in full compliance with the rules. No certification, approval, testing or lab analysis are required! nutraCoster complies with both US NLEA and Canadian Food and Drugs Act specifications. If you plan to offer food products for retail sale, supermarkets and other retail outlets expect and require your product packages to include Nutrition Facts panels regardless of whether government regulations apply to your company. It has become customary and the sign of a professionally prepared product to include Nutrition Facts panels on food labels. This makes nutraCoster an especially valuable tool for new food manufacturers. You can also use nutraCoster to find out how much it really costs you to make your products. Enter your recipes or formulas and the purchase cost of your ingredients. Use nutraCoster to precisely calculate materials costs, labor costs, packaging costs and overhead costs. Please be sure to read the Frequently Asked Questions section below. It is extremely helpful. nutraCoster features can be expanded with the optional stockCoster 2.1 module for tracking, valuing and analyzing your raw materials and finished goods inventory. Click here for details about stockCoster 2.1. Nutrition Labels: Print required nutrition labels. Product Costing: Calculate complete product cost including labor, packaging and overhead. Nutrition Analysis: Calculate nutrition content of your recipes or formulas. Product Pricing: Are you charging enough for your products? Use nutraCoster to help you find out. Profitability: Which of your products is the most profitable? Which ones lose money? nutraCoster can tell you. Recipe Scaling: Print production requirements for any size batch. One of nutraCoster's most important functions is composing the nutrition and ingredient labels you need for compliance with US and Canadian food product packaging requirements. The required labels usually have two parts: the Nutritional Facts panel and the Ingredients panel. Both panels are created automatically from the recipes you enter into nutraCoster. The labels can be either printed on stickers for immediate use on your food products or exported as graphic files (.jpg, .bmp, .wmf or .emf) so they can be inserted into overall packaging and label graphic files. You can give these files to your professional printer or graphics designer. Nutrition Facts and Ingredient panels are usually printed together, but the Nutrition Facts panel can also be printed alone. Nutrition Facts: This is required on most products that are offered as packaged items for sale to consumers in grocery stores. The requirement applies to all bakeries and food producers unless exemptions are sought. Even with exemptions, grocery stores customarily require Nutrition Facts and Ingredients panels regardless. Ingredient Panel: Every ingredient must be listed in order of predominance by weight. The actual weights or portions are not mentioned. Ingredients can be named in required languages (i.e. Engish and French) or include subrecipes (i.e., "Bread (flour, eggs, ...)") . Standard Format is for any package with more the 40 square inches of surface that can bear labels. Linear Format is for smaller packages. Side-by-side is similar to Standard, but is wide instead of long. Tabular is for the smallest packages. Canadian Formats: nutraCoster is fully compliant with Canadian regulations. There are eight approved Canadian label styles. Canadian regulations became mandatory 12/6/2005. Direct Label Printing: For sample and small production runs, nutraCoster can print directly on sticker paper for small quantities, with up to six labels per 8.5 x 11 sheet. For larger runs, you insert the label graphics files into word processing software to fit special size laser stickers or continuous-feed stock. Label File Export for Normal and Large Production Printing: For normal and large production runs, nutraCoster exports Nutrition Facts panels as graphic files (jpegs, bitmaps, etc.) which are used by label printing and professional package design software as graphic elements in the overall label or package design. nutraCoster also exports into the most popular label printing software for thermal label printers (Zebra, Datamax, etc; see the list of label printers from FoodSoftware.com in the left margin of this page). 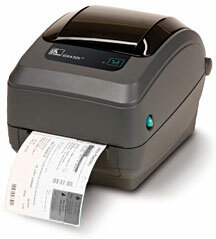 Label printing software is usually bundled with the purchase of label printers. You enter your recipes/formulas and the purchase cost of your ingredients. 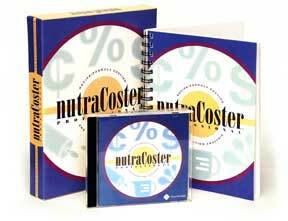 nutraCoster calculates the product cost including labor, packaging and overhead for any size batch. nutraCoster uses state-of-the-art production control technology (known as a "multi-level bill of materials") to accurately calculate materials cost, labor cost, packaging cost and overhead cost. Include an unlimited number of ingredients and unlimited process steps for each recipe/formula. Use any recipe as an ingredient in another recipe. This allows mixes, sauces, batters and doughs to be easily used in more than one product. Scale recipes to calculate the cost and ingredient requirements for any size batch. Enter unlimited length instructions for each process step. Account for moisture loss and other production losses. Obtain extremely accurate labor costs by breaking the production process into individual process steps (such as mixing, baking, finishing, etc.). Divide each process step into setup time (which is constant for any size batch) and assembly time (which is proportional to batch size). Assign one or more workers to perform each process step. Assign each worker to a labor class. Use the Labor Cost Calculator to assign a burdened labor cost to each Labor Class, including taxes, benefits, etc. Use the Overhead Calculator to accurately calculate total overhead costs. Allocate overhead to products or to labor classes. Determine the overhead contribution to cost for any product. nutraCoster includes an ingredient database with nutrition information for approximately 7,400 common ingredients based on USDA data. Optional ingredient libraries contain nutrition information about brand name products from hundreds of companies. Add an unlimited number of additional ingredients to the database. Calculate nutrition content for any size batch or any serving size. Print Nutrition Facts labels that comply with the requirements of the Nutrition Labeling and Education Act (NLEA). Users with laser printers can generate production quality labels. Print multiple labels per page. Include ingredient listing with Nutrition Facts label. Completely and accurately account for nutrition changes during processing, including moisture loss and fat loss/gain. Determine which ingredients contribute calories, fat, etc. to any recipe. Scale recipes by printing any report for any batch size or serving size. Report product costs including labor, materials, packaging and overhead for any size batch. Calculate gross margin or target selling price for each product. Flag products whose actual margins are deviating from the target. Ingredient lists for any size batch. Where-used report - find all uses of any ingredient or mix. NLEA compliant nutrition labels, including optional nutrients. Security features require user login and/or password. Control access to any procedure or report for any user. Any 32-bit Windows including Windows 7, 8, 10, Vista, Windows XP, Windows 98,Windows ME, Windows 2000 or later. nutraCoster Professional 2.1 will not run under Windows 3.1, Windows 95 or Windows NT. Pentium 200 or faster processor recommended. 32 MB RAM or more (64 MB recommended). Apple Macs: nutraCoster requires Windows to run and can run on recent Apple Macs providing they have Boot Camp or Parallels and Windows. nutraCoster does not run on the Mac operating system software without Windows. I'm in a hurry. Can I download the software and start using it today? Yes, download delivery is the normal delivery method for this software. Download instructions are sent via email within a few hours of your purchase. Downloads are available most days, but not all, because the download process takes a few manual steps on our part. The download installation is completely self-contained and includes the instruction manual. Does nutraCoster already have my ingredients in its database? nutraCoster comes with data for 7,400+ ingredients. That's a lot of items. Your ingredients are extremely likely to be included. Can I add my own ingredients to the file? Yes, you can add your own ingredients to the database. Note that it is also normal and expected for you to add your own ingredients to the nutritional database. The included database has thousands of the most common ingredients with many variations (raw, baked, boiled, etc. ), but there are millions of ingredients available in the world. The ingredient nutritional data you need to add is usually readily available from your supplier by asking for their "detailed" or "100-gram" nutritional analysis of the ingredient. Where do I get nutritional information for ingredients that are not in your database? Contact the manufacturers of the ingredients- they are usually happy supply you with nutrition data. You can add this data to the database yourself. What about organic and gluten-free ingredients? For nutritional reporting purposes, organic and gluten-free ingredients are treated the same as all other ingredients. (Our customers include a large number of organic and gluten-free food makers.) For our purposes, organic ingredients are the same as regular ones because the pesticides and hormones that organics lack do not show up in the Nutrition Facts panels anyway. If your ingredients are unusual (likely for gluten-free), you will can add your own to the database (see the above). What is in the supplemental database? The supplemental database (called "Libraries II and III", $39) contains an additional 2,500 common ingredients from more than two hundred manufacturers, such as General Mills, ADM and Pillsbury. The big difference between the supplemental database and the USDA database is that the USDA is mostly generic items, while the supplemental is all branded items. To order this, call or select the option in the shopping cart. Does nutraCoster help me meet my obligations for product nutritional reporting? Does nutraCoster handle the latest requirements? If you are not satisfied with this software for any reason, you may return it for a refund within 45 days of receiving the product. How easy is nutraCoster to use? And how does your support work? nutraCoster is used by the owners and operators of food companies themselves and does not require computer professionals to operate the software. However, nutraCoster is professional software with sophisticated features that serve important needs, so it does require some reading and studying. But if you have any questions or difficulties, telephone support is free, unlimited and extremely expert. How often are there updates and how much do they cost? Can I print my own labels with nutraCoster, including product names, bar codes, etc.? nutraCoster is not meant to be a complete product labeling tool and it does not compose or print complete package labels. The "heavy lifting" that nutraCoster does is the nutritional analysis of product recipes needed for the composition of US and Canadian regulation Nutrition Facts panels. To print your own labels in commercial quantities, most people use label printing software such as EasyLabel or LabelView with thermal printers such as those from Datamax or Zebra. (Look in the left margin of this page to see food label printers from FoodSoftware.com.) It is the label printing software's job to compose the complete label with Nutrition Facts panel (imported from nutraCoster), product name, bar code, etc. Can I print my own Nutrition Facts label using my own printer and Avery stickers? And which Avery stickers? You can but the far better and more economical solution is to use the software and thermal printers described above. 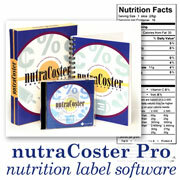 nutraCoster allows you to print up to six of the same Nutrition Facts panels on a standard 8.5" x 11" page. You can position each of the six panels independently. However, there is no standard, pre-cut Avery form that fits the six Nutrition Facts panels, so you have to cut the full sheet by hand to make this work. That's only OK for very small runs, and besides, the full page stickers are expensive. My food product is very small. What is the smallest Nutrition Facts panel that nutraCoster can make? The smallest panels that nutraCoster makes directly are 5 1/8" x 1 5/8" or 4 1/2" x 1 1/8". However, you can use the text and formatting that nutraCoster provides to make much smaller labels. The regulations state that if your product package has under forty square inches to bear labels, you can use the Linear format panel (see the example below) and use type sizes down to 4.5 points (almost half the normal 8 point size), providing they are clear and comply with some other rules. Basically, you use the full-size label that nutraCoster makes as a model and copy the style so that what is larger and bolder remains such, only with smaller type. You should be able to make a Nutrition Facts panel for almost any small package this way. Can I run nutraCoster on a network and have multiple users on a network? Yes. You can install the software on a host computer and then run the software from a single networked computer. If more than one user needs access to the software, there is a licensing fee of $99 for each additional user. Can I install nutraCoster on more than one computer? Does nutraCoster run on the internet or require an internet connection? No. nutraCoster is traditional software that installs on your own local devices, keeps its data on your own devices and not on the internet, and does not require an internet connection to function normally. Your recipes and data remain secure and private on your own devices. Above is an example of a Linear format Nutrition Facts panel. It is the simplest of the various formats and it is the only format that can be shaped and sized as needed. It can be reduced to nearly half of the size shown and can be made wider or taller to fit almost any small package (if the package has forty square inches or less for labels). Above is an example of a US Standard format Nutrition Facts panel, actual size. Above is an example of a Side-by-Side format Nutrition Facts panel. Above is an example of a US Tabular format Nutrition Facts panel. Above is an example of a Canadian English and French horizontal format Nutrition Facts panel. Above is an example of a Canadian English and French vertical format Nutrition Facts panel. The screen shots below are a just small selection of examples so you can get an idea of what nutraCoster looks like and how easy it is to use. Above is an example of a nutraCoster ingredient item setup. Above is an example of a nutraCoster ingredient nutrition values setup screen. Above is an example of a nutraCoster recipe ingredient list setup screen. Above is an example of an recipe instructions setup screen. Above is an example of a nutraCoster print menu sub-menu. Click here to download the nutraCoster 2.1 demo (about 14MB). You can only add ten items to the Master Items List (the actual software is unlimited). You cannot import Recipes/Formulas or Ingredient Libraries (the actual software can import). You cannot change item descriptions (but you can with the actual software). Single user only (but additional user licenses for are available for the actual software for multi-user use on a network). Important Note About the Demo: "AVG" brand antivirus software falsely says this demo is virus infected. Please ignore this warning if you are using AVG. If in doubt, use any other antivirus software and there should be no virus warnings. This item has a 45-day money back guarantee (excluding shipping and unreimbursed charge card fees). *Download delivery is normally available within an hour of purchase during Pacific business hours and less quickly at other times (as there is some manual processing on our part). "SweetWARE", "nutraCoster" and "stockCoster" are trademarks of SweetWARE.